If you don't like bitter-sweet music, which sounds like Nostalgia Pop music from the breezy 60's, you can skip this article right now. 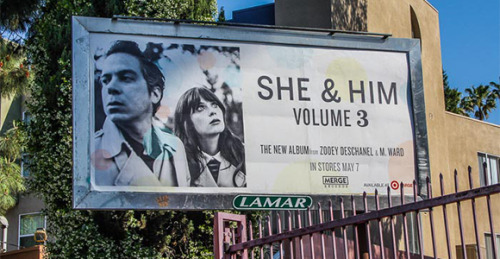 If you like this kind of music, I'm convinced you'd love the new release of She & Him named Volume 3, which was released on 7th of May, 2013. This album continues the same spirit of the previous ones made by the collaboration of Zooey Deschanel (Yeah, the cute girl from New Girl and Indie movie  Days Of Summer) and M. Ward. In contrast to their earlier records, this one is more mature, maybe because it was the first release since Zooey Deschanel and her her husband, Ben Gibbard from Death Cab For Cutie, separated. The music may sound sweet, but the songs' lyrics are about togetherness and separations, which make you wonder what the hell Ben Gibbard was thinking about when they divorced. Meanwhile, it seems that Zooey Dschanel keeps doing the things she likes in her own sweet way and it sounds great with the melodies of M Ward guitar. That's not a ground breaking album but it'll keep you warm in colder nights.